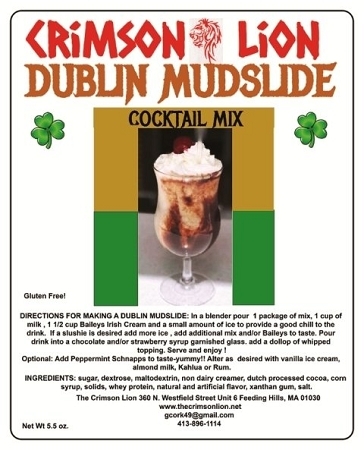 For that special Irish drink, you have to try the Dublin Mudslide. 1 cup Baileys Irish Cream and a small amount of ice to provide a good chill to the drink. If a slushie is desired, add more ice, additional mix and/or Baileys to taste. Pour drink into chocolate and/ or strawberry syrup garnished glass, add a dollop of whipped topping. Serve and enjoy! Optional: Add Peppermint Schnapps to taste-yummy!! Alter as desired with vanilla ice cream, almond milk, Kahlua or Rum. Chocolatini Directions: Fill martini glasses with ice to chill. In a pitcher combine mix with 2 cups of water, 1 1/2 cups Vodka. Stir to combine. Add ice and stir briskly. Just before serving, remove ice from glasses and strain mixture into glasses.